Everyone likes to make silly things, this craft will keep creating long after the glue dries. 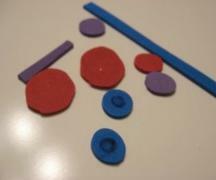 All the pieces have magnets on them so children can put them together however they feel like. Please please be careful with anything magnetic with kiddos that still put things in their mouths, do not let them play with it unattended! 1. Gather your materials. You will need 1-4 foam sheets, I am using a sparkle one which you can buy in a single sheet at a craft store. 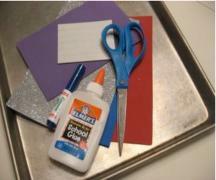 You will also need scissors, glue, a marker, magnetic strips and a fridge or cookie sheet to play with. 2. 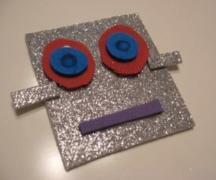 Start by drawing your robot pieces on the back of the sparkly foam sheet. 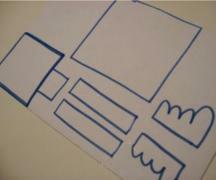 I drew a square, 2 small rectangles, 2 wiggly legs, a large rectangle and a small neck piece that I ended up not using. 4. Cut out some small foam pieces to make eyes, buttons and other decorations on the robot. 5. Glue the foam pieces on. Let dry. 6. 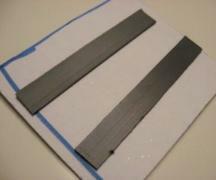 Flip the robot parts over and add the magnetic strips. 7. Create your funny robots!